Few tools have changed angling as much as fish finders have. These sonar units have given anglers the chance to see the previously unknown world beneath the waves, which allows them to not only find fish, but locate and scrutinize the locations in which the fish are holding too. And while fish finders were formerly toys for those of means, the technology has become much more affordable in recent years. Some manufacturers even produce entry-level models that cost less than a day’s worth of boat fuel. As these entry-level fish finders have become more widely available, an increasing number of anglers have begun mounting them to their boats and benefiting from the data these tools provide. This has helped these anglers to have more success and probably played a role in increasing the popularity of angling in general – it is just more fun to fish when you can see what is going on beneath your boat. But after spending a season or two on the water with an entry-level fish finder, most anglers begin to push the limits of the tool. This causes them to consider upgrading to a mid-level unit, which provides superior image quality, features and capabilities. The Garmin STRIKER 5dv is one such product, and it is one of the most popular choices among anglers shopping at this price point. Given its impressive slate of features, it is easy to see why the STRIKER 5dv has become a favorite of many anglers. However, there are a few better-equipped options on the market at a similar price point, so the Garmin STRIKER 5dv earns a B- grade from Fishing Tech. Unlike the entry-level fish finder market, in which GPS capabilities are rare, most mid-level fish finders include GPS capabilities. So, while it is not especially surprising to find this type of functionality in the STRIKER 5dv, it is important to note that the included GPS module is extremely accurate, and provides several key tools to help you navigate around the lakes, rivers or seas you frequent. Traditional sonar technology relies on transducers that only emit sounds of a very small number of frequencies. These units find fish and penetrate to great depths, but they do not offer much detail or clarity. However, the STRIKER 5dv also uses CHIRP sonar technology, in which the transducer sweeps across a range of frequencies, thereby collecting much more data than a traditional unit does. This allows the 5dv and other CHIRP-capable fish finders to produce much clearer images, with greater target separation than their traditional counterparts. In addition to utilizing CHIRP sonar, the STRIKER 5dv also includes a scanning sonar module. Called DownVu by Garmin, scanning sonars collect an incredible amount of data, which allows them to produce near photographic-quality images of the hard structures below your boat. This is excellent for scouting shipwrecks and other manmade objects on the bottom of the lake, as well as sunken trees, gravel beds and creek channels. The Garmin STRIKER 5dv was designed to not only work while cruising across the surface or slowly poking along with your trolling motor – it also includes a built-in flasher, which is very helpful for those who fish while stationary. For example, the STRIKER 5dv works very well for vertical jigging, and it can display the depth of your lure, as well as the fish you are targeting. The flasher also makes the 5dv a wonderful tool for ice anglers – particularly when paired with the optional ice-fishing bundle. Generally speaking, the more information you have at your disposal, the better a decision you can make – and this is especially true when discussing fish finders. It may be helpful to use a fish finder that provides you slightly crude information about the fish holding below your boat, including their size, orientation and depth; but it can be incredibly enlightening to be able to see the details of sunken ships, trees or other hard surfaces. This will allow you to target a given branch on an individual tree, for example, rather than blindly dropping your lure down near some unidentified object. Top-notch water resistance is an important feature in any fish finder, and the STRIKER 5dv enjoys exactly that. The STRIKER 5dv enjoys an IPX7 water-resistance rating, which means that it is not only adequately protected to deal with splashing water, it can even be submerged for up to 30 minutes in 1-meter-deep water without suffering damage. This provides great peace of mind for kayakers, as it means the STRIKER 5dv can likely survive, should your kayak briefly roll over. Even those who are comfortable with fishing electronics and have accumulated a bit of experience using a fish finder will sometimes struggle to learn how to operate newly purchased models. This can cause you to spend more time thumbing through an owner’s manual than fishing. But fortunately, the STRIKER IPX7 features a very intuitive user interface, which most users can learn to operate quickly and easily. It doesn’t matter how much data your transducer can collect if your screen can’t display it; but the Garmin STRIKER 5dv’s color screen produces a clear, crisp image that can be seen easily in most weather conditions. The 5dv’s 480 x 800 pixel, WVGA Color display produces great detail and is easy to see from just about anywhere on deck. Anglers accustomed to smaller, 4-inch screens will be pleasantly surprised how much easier it is to see the images on those only an inch larger. Many anglers consider having access to GPS data to be critical for fishing success. Without it, you cannot easily find productive areas once you’ve left them, and it is more difficult to navigate around the water in general. But the STRIKER 5dv possess a highly accurate GPS module, which not only indicates your location, but your speed too. High-quality 5-inch display screen produces sharp, easy-to-see images. Uses traditional, DownVu and CHIRP sonar technologies to provide you with the most information possible. IPX7 water resistance ensures that your sonar won’t stop working when you are fighting big waves. Comes with everything you need to mount the transducer on your transom or trolling motor. It does not come with a great deal of documentation, which can make installation tricky. Anytime you are shopping for fishing gear, you want to compare the item under consideration with other options to ensure you get the most value for your dollar. This includes both the other models produced by the manufacturer in question and those produced by competitors. The 5dv is one of the mid-level units in Garmin’s STRIKER series, which means that you can find both more affordable and more expensive options among their product line. The STRIKER 4cv is the most similar unit available at a lower price point, and it provides most of the same functions that the 5dv does. The biggest difference between the two units is screen size; the STRIKER 4cv only has a 4-inch screen. Moving up in price, the STRIKER 7cv boasts a 7-inch screen, but is otherwise very similar to the 4dv. Note that the STRIKER 5dv is actually a discontinued unit, which Garmin no longer produces. It has been replaced by the STRIKER 5cv, which is virtually identical to the 5dv. The change resulted from a legal issue over the use of the term “DownVu,” so Garmin now uses the term ClearVu when describing their scanning sonar technology. The two most comparable fish finders to the Garmin STRIKER 5dv include the Raymarine Dragonfly 4PRO and the Lowrance HOOK-7. The Raymarine fish finder is a fish finder/GPS combo unit like the STRIKER 5dv, but it provides more features than the Garmin product does, including a microSD card reader and Wi-Fi compatibility. Additionally, while both units are similarly priced, the Dragonfly 4PRO is a chart plotting unit that often comes preloaded with maps, while the STRIKER 5dv does not provide chart plotting functionality. The Dragonfly 4PRO screen is also specially designed to provide crystal-clear images in any weather conditions. The Lowrance HOOK-7 and the STRIKER 5dv have broadly similar features and capabilities, but the Hook-7 provides chart plotting capabilities and has a screen that is 2 inches larger than that of the STRIKER 5dv. This can make it much easier to appreciate the fine details displayed on the screen, and makes it much easier to use multi-panel layouts. See our Lowrance HOOK-7 Review. Although there are other units available that provide better features or larger images than the STRIKER 5dv, it remains a solid choice for many serious anglers. Aside from chart plotting capabilities, it has all of the features you’d expect from a mid-level fish finder and most users have found it easy to operate. 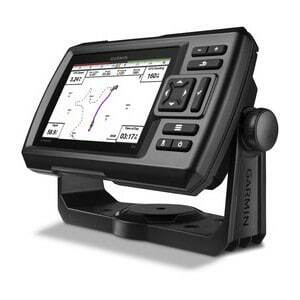 If you are ready to move up from your entry-level fish finder, the Garmin STRIKER 5dv deserves serious consideration.